Fourteen local people were honoured for their contribution to the quality of life in Maybole at a special ceremony in the Town Hall last Thursday, December 1. Chairman of Maybole Community Council David Kiltie welcomed them and their families and friends to the ceremony for what he described as a very special occasion for the community council. Councillor Alan Murray added his congratulations to the fourteen and complimented Maybole Community Council and its forerunner Maybole Community Association on being “can do” organisations. 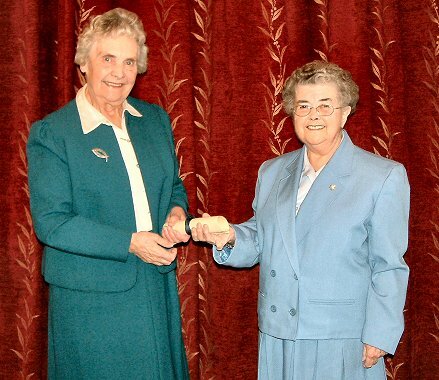 Mrs Margaret Grant, one of the longest serving members of the local Opportunities in Retirement group then officially presented scrolls to Danielle Connolly and Ali Roy for bringing recognition to Maybole through their involvement in football and chess respectively. Mrs Grant then presented scrolls for services to the community to Hugh Anderson, Elaine Campbell, Marjory Donnachie, Gillian Durrant, David Hunter, David Killicoat, Estella McEwan, Lillias McFarlane, Heather Muir, Susan Whiteman, and Archie Wotherspoon. Pictured at left is Minnie Gallacher who was unable to attend the ceremony and her son picked up her scroll. Mrs Grant met Mrs Gallacher separately to present it to her. Click on the image on the right to view a blank scroll full size. Alex Kelly presented Mrs Grant with a basket of flowers and David Kiltie thanked Councillor Murray for his remarks and Mrs Grant for presenting the scrolls. He continued, “Others who are also due thanks include those who nominated individuals; our panel who gave a great deal of consideration to all the names; Alex Kelly and his committee who organised this evening; Anne Walker for all her work in producing the scrolls, Town Hall staff and June Dunlop for the flowers. I would especially like to thank those community councillors who put so much effort into this evening and everything leading to it. He noted that Councillor Andy Hill had resigned from South Ayrshire Council and on an evening when appreciation of commitment and service was being recognised he said that Councillor Hill’s time in office should be noted. 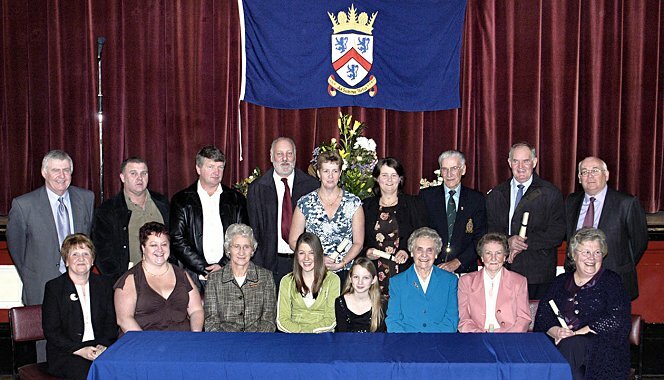 He went on to quote the words of Councillor Hill at the last presentation of Scrolls of Appreciation in December 2000. 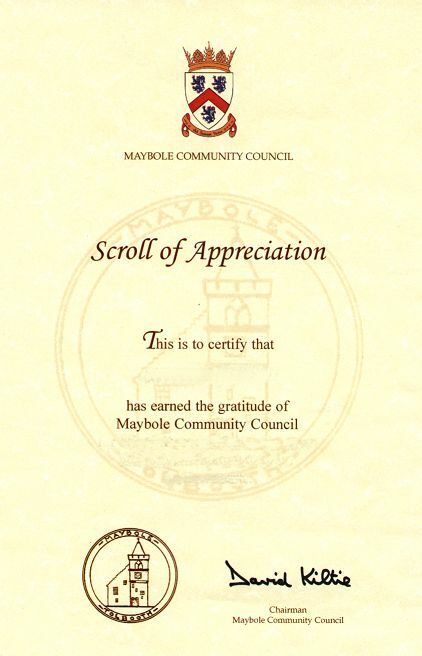 Councillor Hill had described the idea of presenting Scrolls as an "excellent initiative, which proudly recognises those from Maybole who have recorded outstanding achievements in service to the community." Addressing those who were to be awarded scrolls, he had said, "Whether it be by devotion, commitment, or duty, each of you has performed a service for the benefit of the community in a manner which reflects highly, not only on your own self-esteem, but on Maybole." He had continued, "I congratulate each and every one of you. Without a doubt, you have demonstrated that you are worthy of public recognition in the best manner that Maybole, and its community council, can bestow." Mr Kiltie said he could think of no finer words to apply to this year’s recipients other than to say that their efforts really were appreciated in the community and by the community council.